Solar panels are being installed all over the United States. 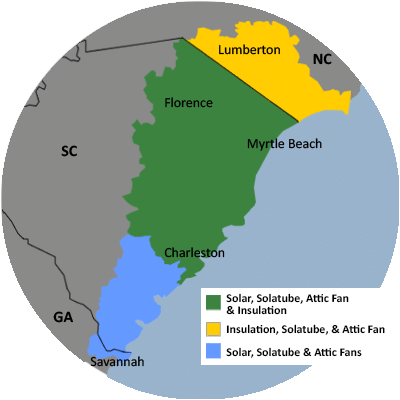 Here in South Carolina there have been more than 12,000 solar panel installations! With solar on the rise, we recommend our customers read the SEIA Solar Variation Guide. With nearly 1.6 million residential solar systems in the United States alone, and new solar systems being installed roughly every 90 seconds, homeowners need to know the values that come with solar energy. “Whether purchasing a house with a solar system on the roof or looking to install a new system on your home, many homeowners are faced with the dilemma of trying to understand how to properly determine the value of that system, both for themselves as well as any future owner of their property. This guide seeks to educate homeowners on the various methodologies professionals use to value a solar system, some of the key drivers impacting that valuation, and tools and information to help ensure they receive an accurate value estimate when buying or selling a solar system,” (www.seia.org). Income Approach – Understand the value of the solar system based upon the projected income a solar system will generate over its expected lifetime. Cost Approach – Understanding the cost to reproduce or rebuild the solar system that is currently attached to the house. Comparable Sales Approach – Understanding the comparable value of a home with and without a solar system to determine the solar system’s impact on the home sale price. SEIA recommends that homeowners focus on the income approach to determine the value of a home solar system because it estimates the forward-looking value of the energy cost benefit. If your realtor or home appraiser is not using this method, find one that will. Or, call one of our solar professionals to meet with your agent to educate them on the “real” value of solar!